This is a chili that I make when *gasp* we don’t have a bean in the house. 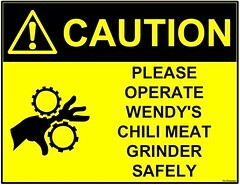 Hubby loves Wendy’s Chili, but I can’t bare to eat something like chili from a fast food place. Since chili is one of those things you make with scraps of this and pieces of that, I can’t imagine what Wendy’s puts in theirs. Yuck! I make sure to serve with with sides(sour cream, crumbled up crackers, cornbread, etc) and piping hot. It’s a great recipe for “game day”, since some people don’t care for beans in their chili. Some ingredients need a bit more explaining, so see the notes at the end of the recipe. Brown meat and onion in a skillet over medium high heat. Make sure to break the meat into small pieces. Once it is all browned and onions are somewhat translucent, sprinkle with salt and pepper and turn off heat. Place the meat/onion mixture in your slow cooker. Top with salsa, tomato sauce, chili powder and cumin. Mix well. Cover with lid and put on low for at least 3 hours. This can go up to 8 or 9 hours in the slow cooker, so this is a great meal to turn on before you leave for work. Once you are ready to eat, turn off slow cooker, add the cinnamon and chocolate. Stir until the chocolate is fully melted. *If you like your chili thin like a soup, use the 29oz can of tomato sauce, but if you like it chunky, only use the 15 or 16 oz can. If you like heat with your chili, use medium salsa. If you like to control the heat in your chili by adding your own amount of hot sauce or cayenne after, use the mild and then add the heating ingredient of your choice. The medium salsa won’t make it spicy right off the bat, but it will build up the heat. The chocolate helps cut the heat a bit so it doesn’t come full force at you.